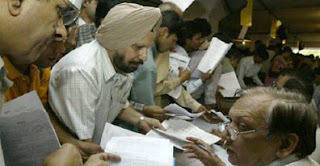 "Today I am so happy after listening this great news because there are approx 85 lac salaried tax persons whose taxable income, including salary and interest income, is up to Rs 5 lac, are not required to file income-tax return from now onwards"
"An individual whose total income for the relevant assessment year does not exceed Rs 5 lakh and consists of only income chargeable to income tax under...Salaries...[and] income from other sources, by way of interest from a saving account in a bank, not exceeding Rs 10,000 have been exempted from filing the returns from assessment year 2012-13," it said. To claim income tax refund, however, such persons will have to file returns. Prior to the notification, it was obligatory for all salaried persons to file income tax returns under the Income Tax Act, 1961.